May 27, 1999 - CONCORD, N.C.
Ron Hornaday is ready for a new challenge. And NAPA and Dale Earnhardt Inc. are ready to face it with him. APA and DEI announced Thursday a three-year deal to put Hornaday, a two-time NASCAR Craftsman Truck Series champion, in the familiar No. 3 Chevrolet in the NASCAR Busch Series Grand National Division beginning next season. Dale Earnhardt Jr., currently drives the No. 3 Monte Carlo, but is moving up to the NASCAR Winston Cup Series next season. Steve Handschuh, president of NAPA Auto Parts, said the company has enjoyed its involvement with the NASCAR Craftsman Truck Series, but looks forward to its new challenge. "Our participation in the truck series has been very worthwhile," he said. "We've been very pleased with our association. I would like to announce that we are transitioning. We will be sponsoring Ron Hornaday in the No. 3 car in the NASCAR Busch Series beginning in the year 2000. We've been very pleased with Ron's performance, the team's performance, and we think they'll be awfully competitive in the Busch Series. We've signed a three-year agreement, so we'll be around for quite awhile." Hornaday, the winningest driver in the NASCAR Craftsman Truck Series with 25 victories, competed in the season-opening NASCAR Busch Series race at Daytona, starting 32nd and finishing 34th. He has five total starts in the series under his belt. "I am excited about racing in the NASCAR Busch Series next year, but my focus right now is on winning a 3rd NASCAR Craftsman Truck Series championship," Hornaday said in a press conference at Lowe's Motor Speedway.. "The NASCAR Craftsman Truck Series is an awesome place to race, and the competition is tough. I'm going to miss truck racing, but I'm ready for the challenge of a new series. As a kid I dreamed of racing at Daytona, Darlington, Talladega and Charlotte, and now I'm getting my chance to do that. I am very thankful for the opportunity that Dale and Teresa Earnhardt have given me, and everyone at NAPA has been tremendous." Earnhardt says his respect for Hornaday's driving abilities made the move a natural one for his team. "Hornaday is one heck of a driver and he will definitely be a championship contender next year," Earnhardt said. 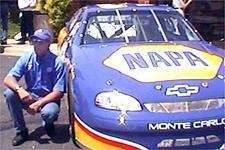 Earnhardt added that NAPA's involvement in the switch was very important. "If it weren't for NAPA, we probably wouldn't have been as competitive in the truck series as we have," Earnhardt said. "We appreciate everything they've done for us. They've added to the program and made it possible for us to go out and do the things we have with Ron. Two championships in three years ain't bad, and of course we're going for a 3rd one. It's going to be a great venture for us. They've been a super sponsor for the last three years. I'm excited about it. "Currently, we are looking at our options for the truck team for next year. We are looking for sponsors and a driver."